West Cork is known for boasting some of Ireland’s most scenic and rugged coastline. The area attracts many people taking a vacation in Ireland due to the fantastic whale watching and sea kayaking opportunities it offers. To add to this, a host of West Cork attractions scooped up top awards in the recent Irish Responsible Tourism Awards. One of the top winners on the day were West Cork based Atlantic Sea Kayaking which was named as the outright winner of providing responsible tourism in Ireland. The family-run business will now go on to represent Ireland in the World Responsible Tourism Awards. It is a fantastic accolade for the company, which was established in the mid 1990’s. 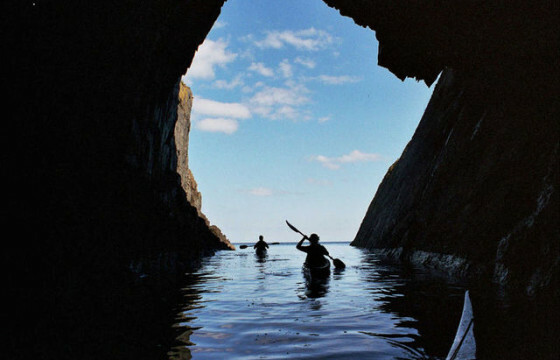 With a concern for the environment at the core of their activities, owners Jim and Maria Kennedy run not only kayaking trips but also walking tours of the West Cork area. The region’s strengths in providing and promoting responsible tourism were also recognised with Whale Watch West Cork, Sheep’s Head Way and the Mizen Head Experience also winning silver awards. To host of places to stay in West Cork there has never been a better time to visit this wonderful part of Ireland. The Sheep’s Head Way received its silver award in the ‘Best Responsible Destination’ category. The award recognises the work completed to establish the Sheep’s Head peninsula’s renowned walking route by promoting a range of experiences to people taking trips to Ireland including Wild Atlantic Way Cruises, guided walks and stone carving weekends. Whale Watching West Cork also received an award for Best Tour Operator for Responsible Tourism. The successful business runs the popular whale and dolphin watching tours from Baltimore, West Cork. Whale Watching West Cork’s respect for responsible tourism as well as its establishment of a code of conduct for whale watching has received many accolades. Another popular attraction, the Mizen Head Visitor Experience, received a silver award for Best Cultural Heritage Attraction. Exploring the geology of the region, the popular tourist hotspot has been drawing visitors to West Cork with its visitor centre for years. It’s popular walk over an arched bridge to the signal station showcase the region’s stunning scenery along with the possibility of seeing seals, kittiwakes and gannets along the walkway. This entry was posted in Activities in ireland, arts festivals Ireland, Best Attractions in Ireland, Best Places to visit in Ireland, Ireland, ireland special offers, Ireland Travel, Ireland vacations, Uncategorized, Visitor Attractions, West Cork and tagged Atlantic Sea Kayaking, Irish Responsible Tourism Awards, Mizen Head Experience, Sheeps Head Way, Trip to Ireland, Vacation in Ireland, Visit West Cork, West Cork. Bookmark the permalink. Here on the Sheep’s Head Way we were absolutely delighted with our award, and to be in such fine company with West Cork neighbours who share our commitment to creating experiences for tourists that are good for our community and our environment too. It’s great to have these awards helping visitors to discover exciting things to see and do!